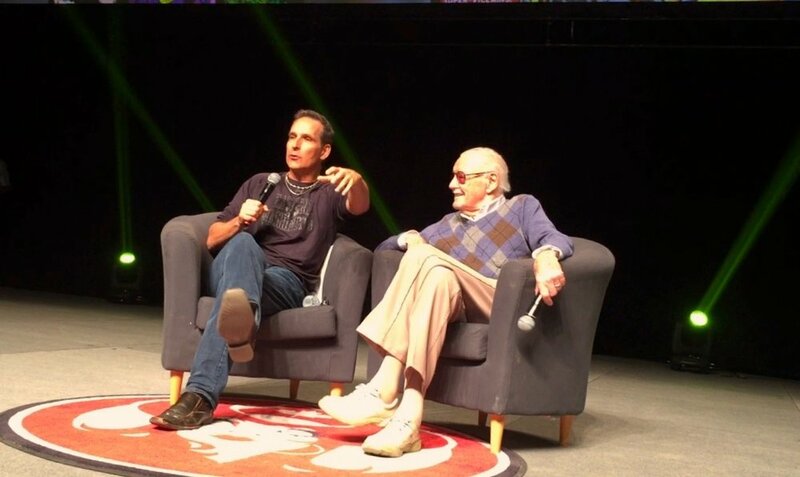 On the final day of the Calgary Expo, Todd McFarlane, on the road to legend status himself, took a backseat to greatness, as he hosted the godfather of comicbooks, 94-year-old Stan Lee. McFarlane reminds Lee that they first met right here, at a comicbook convention in his hometown of Calgary, when he was just 16, long before the birth of Spawn. He asked Lee if he could sit at his table for a bit and simply listen to his conversations with fans. That few minutes of time turned into seven hours. A very early lesson for the eventual founder of Image Comics, from 'The Man' himself. As Lee spoke, the guests hung on every one of his words. He discussed his start in the industry with Jack Kirby, the creation of the Fantastic Four and Spider-Man, and to his many Marvel Studios movie cameos. One fan asked him about his favourite cameo. “THOR ,” he says without missing a beat. Not only because it's one funny scene, but TWO funny scenes. All his other cameos account for a single-scene appearance. He also got a little something off his chest, clarifying the difference between "comic books" and “comicbooks." "Comic books are funny books, and comicbooks are stories with words and pictures,” he says. Spelling matters. Near the end of Lee’s most likely final visit to Calgary (although he’s threatened that before, only to return) he exclaimed “Excelsior” to an appreciative crowd. But the audience quickly went from standing ovation to gasping in unison as Lee stood up and just about flipped backwards over his chair. Thankfully, there's still some Spidey agility left in the legendary man, and he made a quick recovery, gave the crowd a wave and a smile as he walked off stage to more cheers and applause. This story was written by Chris Doucher, Managing Editor for GeekNerdNet.com.